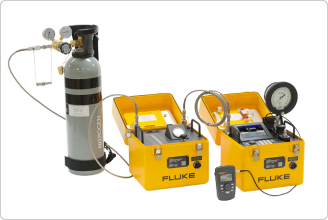 The Fluke Calibration 4322 Automated Pressure Calibration System enables almost any user to calibrate almost any pressure gauge, transducer, transmitter or switch—including vacuum, compound, absolute and high-pressure devices. It provides high-end, laboratory-grade performance across a very wide range, on the bench or in situ. 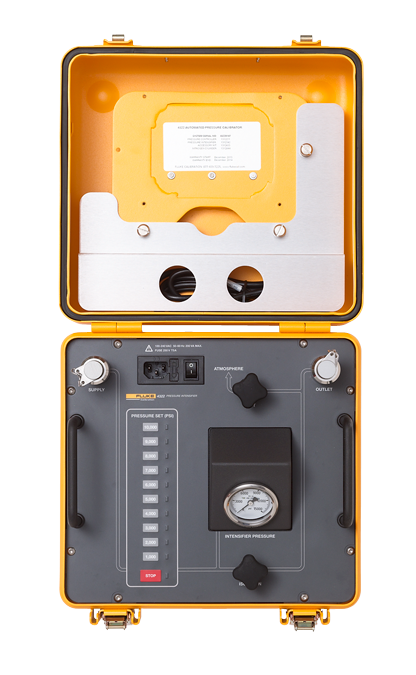 The 4322 system was originally designed to meet the demanding requirements of the United States Navy for a single, rugged, accurate, easy-to-use pressure calibration system that could be used by both novice and advanced technicians for all their critical pressure calibrations, whether on ships or onshore. It is the ideal pressure calibration system for any operation that cannot afford to compromise on performance, ruggedness, or ease of use. Even the best-performing or safest calibrator can fail or produce erroneous results if it’s not used properly. 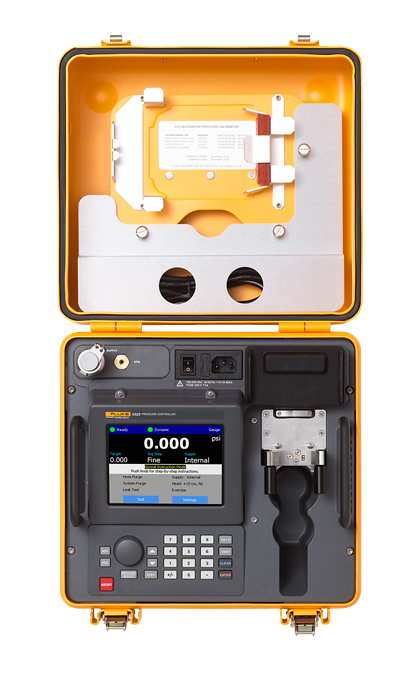 Even though the 4322 packs impressive capabilities and a host of powerful features, it is designed to be so easy to use, even a novice technician can perform confident pressure calibrations with very little training. The intuitive graphical interface includes instructional menus that step the user through a linear workflow to set up and execute pressure calibrations. Physical controls are simple and clearly marked; connections are easy to make and break. The system components are lightweight and compact, so you can transport them easily for in-situ calibration, or use them in a traditional calibration laboratory. The 4322 Automated Pressure Calibration System incorporates several important high-pressure safety features. High-pressure connections feature a “quick-connect” design with integrated safety interlock. Plumbing, adaptors and hoses are rated to burst pressure of at least four times the working pressure. Test hoses feature a protective braided stainless steel sheath to prevent damage. The pressure controller includes over-pressure protection that automatically releases any pressure above the maximum working pressure. The controller relieves pressure and reverts to a safe, vented state if the power is interrupted. A highly visible and accessible “abort” button on both the pressure controller and remote pendant let you stop control and relieve pressure immediately, if necessary. This system has been tested to provide consistent high-end performance in the most extreme environmental conditions. Components are housed in ruggedized, deep-drawn aluminum enclosures that protect them from harsh elements, such as those on ocean-going ships. The patented CalCheck function features redundant sensors to minimize uncertainty and capture early failure or out-of-tolerance conditions. A pneumatic medium with integrated contamination prevention allows you to calibrate all types of pressure devices with a single calibrator, without contaminating gas systems or introducing incompatible liquids into hydraulic systems. Pressure generation and control components and hardware are modular so you can perform preventative maintenance and support easily while minimizing downtime. The 4322 controller also features plug-and-play pressure measurement modules to simplify calibration support. The modules can be calibrated in the controller via an automated onboard calibration routine or removed and sent out for calibration. The color-coded modules can be accessed quickly through the front panel and easily removed and replaced with finger-tight fasteners. The 4322 Pressure Controller is the primary component of the 4322 Automated Pressure Calibration System and is itself a highly capable calibrator. 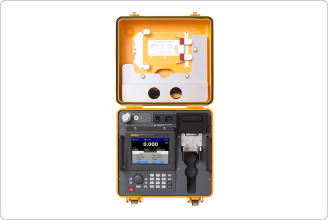 Very wide range measurement and control capabilities and advanced features are packed into one transportable, easy-to-use package. The 4322 Pressure Controller provides 0.1% of reading total one-year measurement uncertainty from low pressure to 10,000 psi (70 MPa). The simple yet accurate percent-of-reading measurement performance enables you to calibrate a wide range of workload with confidence that the test uncertainty radio (TUR) is adequate. Four plug-and-play pressure measurement modules and a barometric pressure module are responsible for the pressure controller’s very wide measurement range. The 4322 switches module ranges automatically and seamlessly during use to utilize the best pressure module for each test point and operation mode. All pressure modules store characterization and calibration information onboard and are interchangeable between systems to simplify calibration support and prevent downtime. Modules can be removed easily and replaced through the front panel with finger-tight fasteners. Each 4322 Pressure Controller pressure measurement module features three redundant pressure sensors. The output of the three sensors is averaged automatically to reduce overall measurement uncertainty. The patented CalCheck feature automatically monitors and compares all three sensors to detect damage or out-of-tolerance conditions in the module, preventing potential measurement escapes before they can result in critical errors and costly recalls. The 4322 Pressure Controller features automated pressure control from low absolute and negative gauge pressures to 10,000 psi (70 MPa). With breakthrough high-speed piezoresistive valve technology, the 4322 Pressure Controller can set and precisely control pressure to its highest range more quickly than even any other high-end benchtop or rack-mount controller available. The pressure controller also features onboard automated vacuum and pressure generation and control, for calibrating devices from less than 1 inHg (0.5 psi, 3.5 kPa) absolute to 300 psi (2 MPa), without any external pressure or vacuum source. Patented pump-control technology enables the pressure controller to control faster, generate lower absolute pressure and control more precisely than other pump-based pressure calibrators. The 4322 Pressure Controller offers adjustable control setting and multiple control modes to most efficiently meet the precision needs for the UUT being calibrated. The 4322 Pressure Controller features an integrated contamination prevention system (CPS) to prevent contamination that can lead to costly downtime, damage and measurement errors. The CPS prevents liquid and particulate contamination from entering the pressure controller by maintaining unidirectional flow away from the controller. Upward pressure excursions are accomplished when the controller introduces clean supply gas into the test circuit through the CPS. Downward pressure excursions are accomplished through a purge solenoid valve located on the CPS, external to the pressure controller. Rather than being drawn into the controller, the gas and any liquid it has drawn out of the UUT are expelled through the CPS into a waste bottle for disposal. 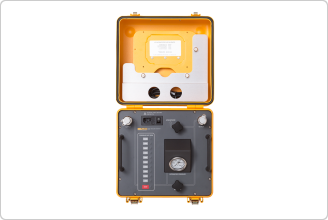 As an extra level of protection against cross contamination of UUTs, Fluke Calibration designed the CPS to be modular and easily exchanged. You can remove and replace a CPS module from the 4322 Pressure Controller in just seconds and with only one hand. Color-coded CPS modules are available to separate “clean” from “dirty” service. You can open and clean the CPS assembly itself in just minutes without tools. The 4322 Pressure Controller features rubberized direct function keys for common operations and a keypad for numerical entry. A rotary selection/jog wheel allows you to quickly increase and decrease pressure during a pressure calibration and navigate efficiently through the menus. The advanced graphical user interface (GUI) makes it easy to review and edit calibrator settings; set up, store and execute test profiles; store results; and print calibration reports directly to any standard printer. The 4322 also features a full library of remote SCPI operation functions that you can access through USB 2.0 type B, IEEE 488.2 or RS-232 connections for full automation. Despite being one of the most advanced, high-performance and feature-packed pressure calibrators available, the GUI makes the 4322 Pressure Controller remarkably easy to use. The “Normal” operating mode makes everyday calibration activities simple to perform, while the “Advanced” mode enables more experienced users to fully utilize the advanced features. In “Normal Mode” operation, only necessary information is displayed as you are prompted through setup and execution of a calibration. The top half of the display consists of a window that clearly communicates pressure measurement and control values and settings. The bottom half of the display houses an instructional menu system that guides you step by step as you set up and execute pressure calibration sequences in an intuitive, linear workflow process. Calibration results with pass/fail criteria are displayed during the calibration and can be saved for electronic download at a later time. You can generate and send a calibration report directly to a standard printer via a USB connection on the pressure controller. “Advanced Mode” allows you to control and measure pressure without stepping through a structured calibration sequence. Use this mode to access settings, data, and less-frequently needed information. The 4322 Pressure Intensifier boosts supply gas from the N2 gas cylinder or other source of clean gas medium to as high as 10,500 psi for high-pressure calibrations. The pressure intensifier employs a patented rotary cam design that drives four pistons to quickly generate the targeted output pressure. Because pressure is generated by four pistons operating in series with alternating compression cycles, the 4322 Pressure Intensifier produces smooth high-pressure output, instead of the significant pressure surges typical with traditional single-piston gas boosters. The pressure intensifier is powered by a high-performance brushless servo motor drive with variable speed control, resulting in quiet operation that does not require facility-grade compressed air to drive it, or liquid lubrication. To operate, simply select the target intensifier pressure from 1,000 to 10,000 psi (7 to 70 MPa) in 1,000 psi (7 MPa) increments by pushing the appropriate key on the pressure intensifier’s membrane keypad. The pressure intensifier controls the variable speed motor to generate and actively maintain the pressure supplied to the pressure controller. The 4322 Pressure Intensifier generates pressure fast enough to keep pace with the 4322 Pressure Controller’s gas consumption during a typical calibration. On-demand pressure generation saves you from having to pre-charge a highpressure accumulator, thus reducing setup and operation time and improving safety. Accessories enable you to optimize a 4322 Automated Pressure Calibration System for various applications. Worksites do not always allow easy access to pressure measurement devices for calibration. The 4322 Handheld Remote Control Pendant enables you to calibrate even the most difficult-to-reach pressure devices while safely and effectively positioning both user and equipment. The remote pendant is lightweight, compact and rugged. A rotary wheel, rubberized function keys and backlit graphical user interface mimic the controls and user interface on the 4322 Pressure Controller to allow one-handed pressure control and step-by-step execution of calibration sequences. The remote pendant features electrical switch test connections and test leads for fully automated pressure switch testing. When combined with an optional 10 ft. (3 m) test hose, you can operate with agility in a tight or difficult workspace. Operate the calibrator while reading the output of the UUT at a remote terminal, or from an otherwise obstructed angle. Set the calibrator on the floor or other stable surface while reading the output of the UUT at a different height. Stand at a safe distance or behind a barrier when performing calibrations in a hazardous location. An optional portable compressed gas cylinder is available to supply gas to the 4322 Pressure Calibration System for operation above the maximum pressure controller pump pressure of 300 psi (2 MPa). The lightweight, aluminum cylinder features a shut-off valve with protective valve guard and a soft shoulder strap for portability. The cylinder can be charged with up to 2,000 psi (14 MPa) supply gas for in-situ calibration. A removable self-venting regulator and high-pressure supply hose with quick-connection adaptors are included so you can quickly and safely connect the cylinder to the 4322 Pressure Controller or Pressure Intensifier. Note: The 4322 Portable Gas Cylinder is certified according to United States Department of Transportation (USDOT) regulations. Use, refill and transportation of the gas cylinder may be subject to local regulation and/or prohibited from use in certain locations. 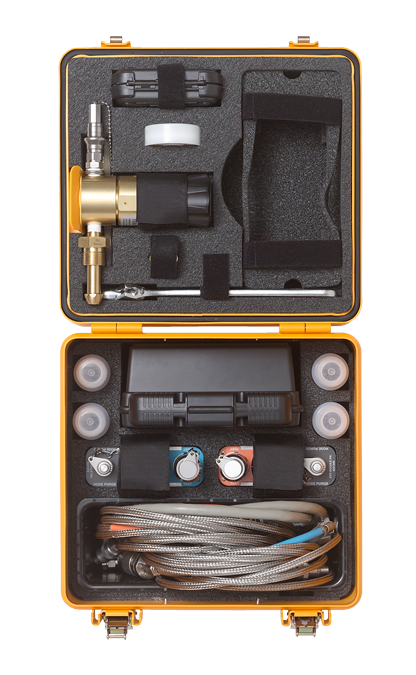 The 4322 Automated Pressure Calibration System features test connection and hose options to further improve ease of use and safety. High-pressure connections in the 4322 Automated Pressure Calibration System feature the Fluke Calibration IQC70 system. IQC70 adaptors are Interlocking quick-connect pressure fittings with working pressure of up to 10,000 psi (70 MPa). The male adaptor (stem) inserts easily into the female adaptor (coupler), where it snaps in and is held in place by retaining pins in the coupler. To disconnect, simply push a collar on the coupler, which releases the stem from the retaining pins. Applying pressure to the connection locks the collar and pins into place, preventing the stem and coupling from disconnecting until pressure is removed from the system. The supply, output and test ports of the 4322 Pressure Controller, CPS and Pressure Intensifier are IQC70 couplers. IQC70 stem adaptors are available for various pressure connection types and sizes, allowing you to mount UUTs directly and easily to the 4322 Pressure Controller test port during calibration. The innovative IQC70 design allows the stem to rotate in the coupling even when pressurized, so you can position the UUT for best visibility. Optional 10-foot (3 meter) test hoses are available to extend the test port if the UUT cannot mount directly to the pressure controller. The 4322 test hoses are rated to 10,000 psi (70 MPa) working pressure, yet are extremely light and flexible. A stainless steel braided sheath protects the durable high-pressure hose from accidental pinching or shearing. Test hoses are color-coded consistently with the CPS modules, so you can easily see the difference between “clean” and “dirty” service plumbing. 4322 Automated Pressure Calibration System components can be combined in different configurations to meet a variety of needs for portability and performance. With only ac mains power, the unit delivers automated vacuum and pressure control and measurement from 0.5 psi (3.5 kPa) absolute to 300 psi (2 MPa). With a portable compressed gas cylinder or other source of compressed test gas supply, the 4322 Pressure Controller automated pressure control extends to 2,000 psi (14 MPa), or approximate source gas pressure. The pressure intensifier unit generates on-demand pressure safely, quickly, and quietly using only ac mains power and compressed gas from a gas cylinder, extending automated pressure control to 10,000 psi (70 MPa). ICQ70 is a Fluke Calibration interlocking quick connection nominally rated to 70 MPa (10,000 psi). 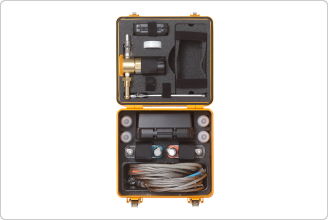 IQC70 is a Fluke Calibration interlocking quick connection nominally rated to 70 MPa (10,000 psi). Working pressures indicated are for adaptors only. Actual pressure capability may be limited by the integrity or maximum working pressure of the fitting to which the adaptor is connected. Hose limited to 3,000 psi due to miniature QC used to connect to the fitting on the regulator. Measurement uncertainty defined as the maximum deviation from the indicated value of measured pressure for 1 year after alignment including hysteresis, linearity, repeatability, stability, temperature, humidity effects, and calibration reference standard measurement uncertainty. Expression of uncertainty uses a coverage factor of 2 and conforms with the recommendations of the ISO Guide to the Expression of Uncertainty in Measurement. Negative gauge and vacuum pressure values assume the ambient atmospheric pressure is approximately 101 kPa (14.7 psi) absolute. Assumes 100 cc test volume with external gas supply. Assumes 50 cc test volume with external gas supply. Assumes 25 cc test volume with external gas supply. Set times assume pressure steps of no greater than 10% of target pressure and reflect time to ready using default control limits in dynamic control mode. Times for sub-atmospheric set points assume that the temperature is below the boiling point of any liquid in the UUT and CPS for the target pressure.